After knocking over some yearling fallow does I am having a crack at Venison Ham, after saying I'm going to do it for the last 3 years. Brining recipe borrowed from here. Pics to come later. Weather forecast said last Saturday morning would be cool and the maximum for the day was only 20 degrees. Been no Spring or Summer here yet in the South East of South Australia ( temperatures are usually up in the 30 - 40 degree range at this time of year). So ideal for a stalk. I was on this block the Friday before for a spotlight and took one young doe but we didn't see many and travelling was slow with long grass hiding many obstacles. Its pretty much flat as a pancake here so very much lazy mans hunting. After leaving the ute and separating from my hunting mate a mob of seven does was spotted in the direction my mate was heading. I stuck close to cover along the fringe and spied a black doe grazing on her own ahead of me. As she turned as grazed away I could see she had bagged up and would have a fawn stashed nearby. Carrying on Emu's spotted me and bolted to cover ( They have excellent eyesight and will spot you a long ways out) scaring 2 kangaroos and 2 deer back to cover. I moved from the edge of cover through the open to a high point in the hopes the emus had not warned everything around. I was rewarded with the sight of 3 deer where the emus took off from. Sneaking down the yearling was dispatched in a poor display of shooting so you don't get photos of that one. Gutted and hung in the trees I set off again around a large mallee knob (Mallee is a short growing Eucalypt tree and gets about3-4 metres tall) to overlook a second hill, a light coloured doe charged up the fenceline trying to find one of the holes under it, she missed her mark and crossed over the rise to me yelling out "Hey,Hey Hey...Hey" she propped front on to me and rolled over at the shot. 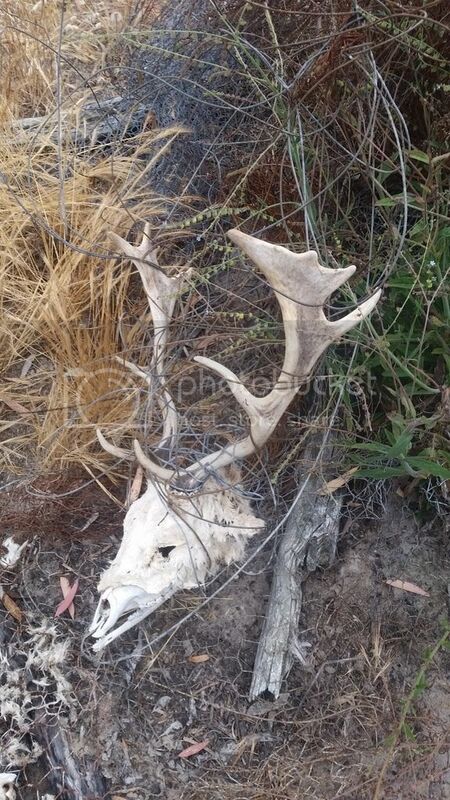 After gutting her I saw some antlers in a pile of old wire and found a young buck had met his demise tangled up just his head and few other bones remained. Anyway off home with the deer skinned and in the chiller by 9am. 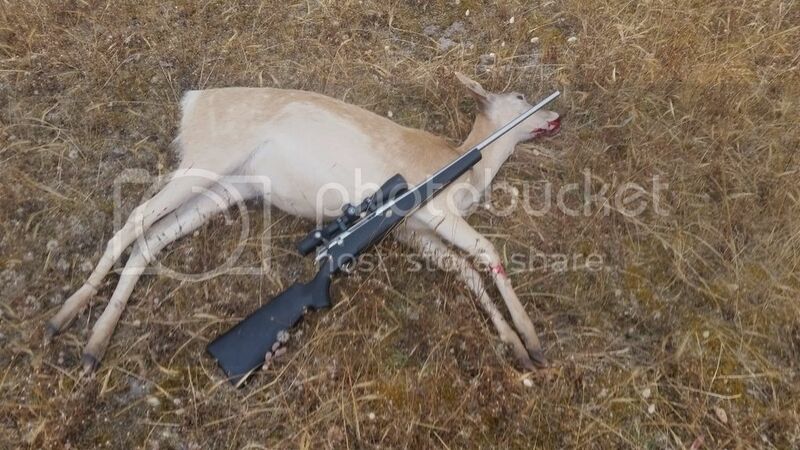 Rifle used; Rossler Titan 6 6.5x55 , 120 gr amax. 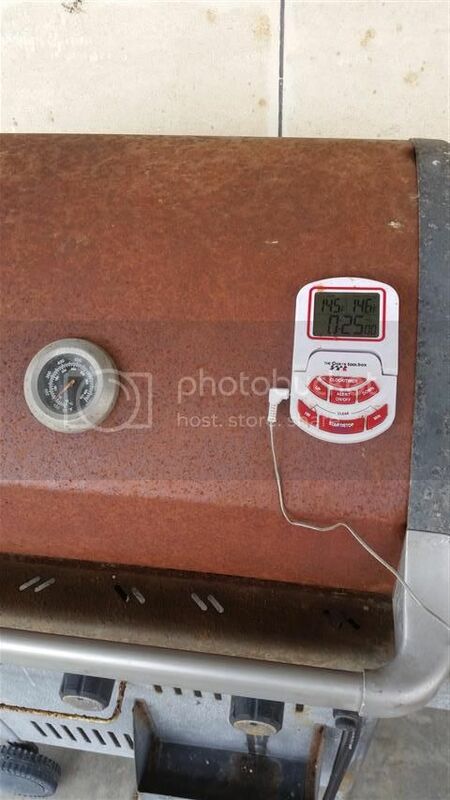 I had an old hooded gas BBQ that had a thermometer on it so figured I would just use BBQ briquettes and chunks of Redgum to produced the smoke so after Christmas I had an experimental morning smoke session to get my procedure right and today fired into it. 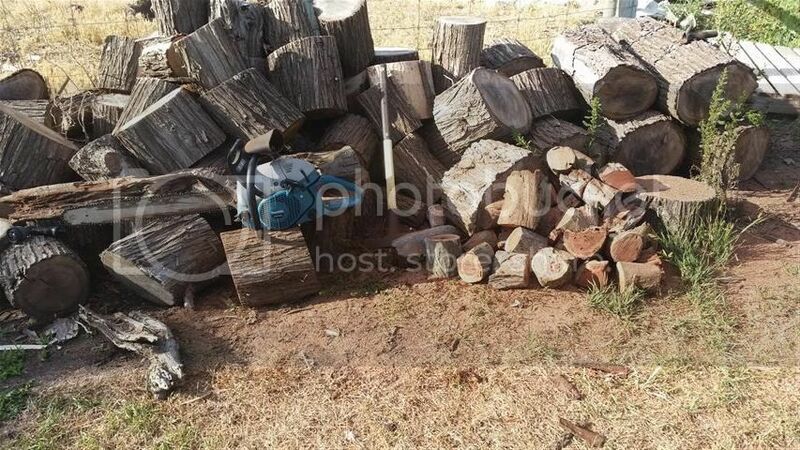 So the chunks of redgum were soaked in a bucket of water and pulled out and added to the coals as needed keeping the temperature in the range of 200-250 degrees F.
It has turned out awesome. Very happy with it. 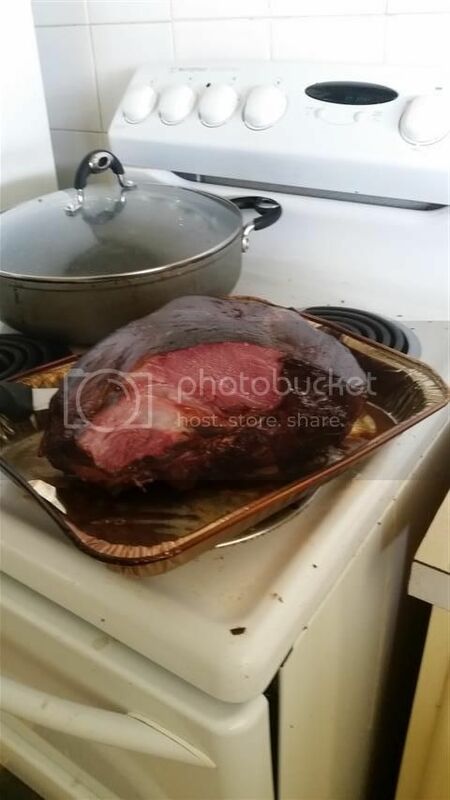 Cooking time was about 6 hours to get to 145 degrees F.
veitnamcam, mrs dundee, Beaker and 3 others like this. So what was in the brine? 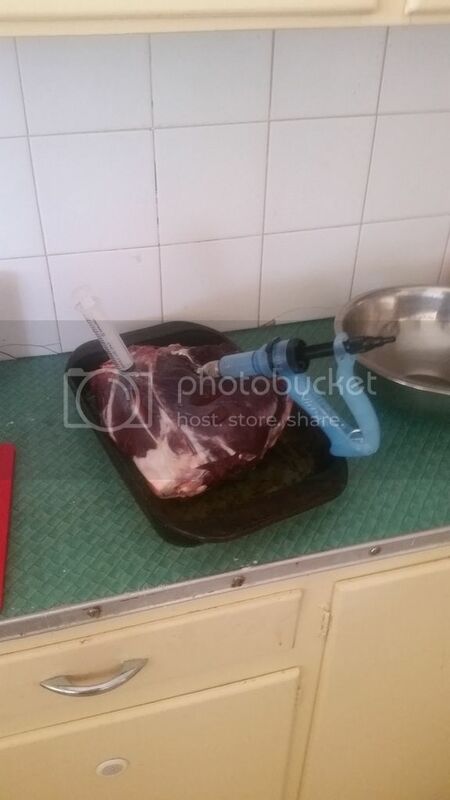 Have done the same with wild pork, venison, goat , use honey dew brine mix with modified drench gun works great tastes good tenderness sometimes ???????????? 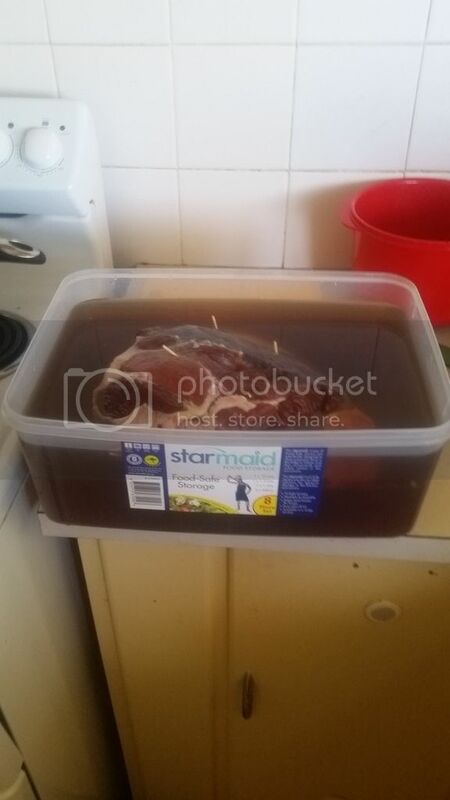 This leg took 5.7 litres of brine total 1 1/2 us gallons, Thats a 20% mixture. 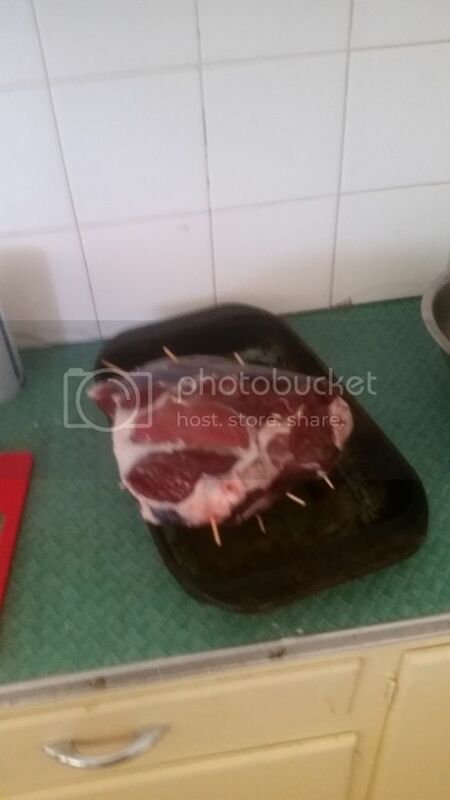 Leg weighed 3kg so 20% of that is 600grams of brine which was injected into the meat. 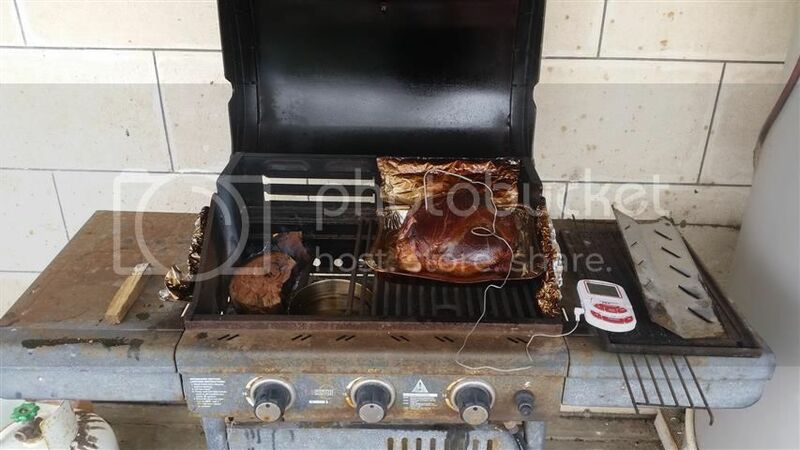 You can adjust the salt and sugar volumes to your taste but you have to have the nitrites at the right rate because Botulism is not that good for you. veitnamcam, johnd and Beaker like this. What sort of flavour does this give? I was always told to stay clear of woods like this and pine as it can be bitter? But Hey i suppose you cant get any manuka there aye! Good write up and results look awesome. 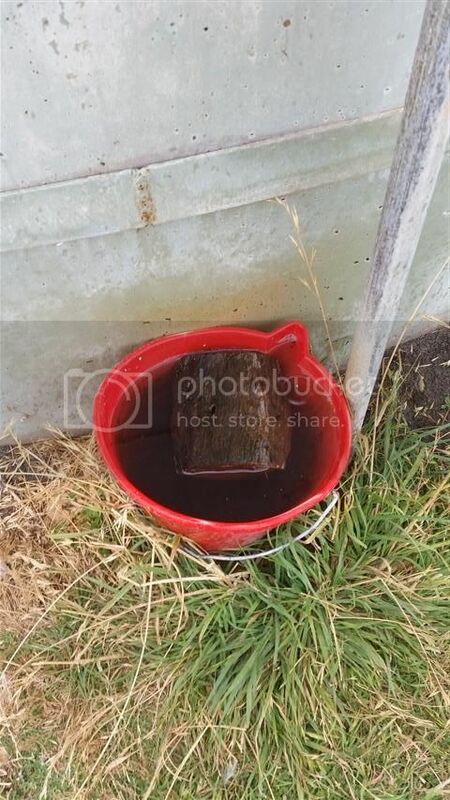 Oh I just reread your post now I think you just used redgum and the Mac is just there posing in the picture. I don't think softwoods are recommended for smoking. We also have Kanuka. Ti-Tree here so for the next one I do I'll try that for the wood. I have a heap of "round" roasts in the freezer so they will be good for turning into hams and won't take long to cook. Last edited by Tuidog; 31-12-2016 at 03:26 PM.